Who are you to come before the Teacher at this time? It is this query that is asked of the student when first presenting the self; the first presentation of the self is in the unconscious state, in the dream state. The Teacher asks, “who are you to present yourself to me at this time?” The answer universally is, “I am miserable…I am unhappy…I am sorrowful…I am fed up…I am done…I cannot continue on this same path…Life has lost its luster…Life is no longer inviting…Life on this planet is hell…I hate myself…I hate everyone…I hate this planet…I want to go home.” The student is not accepted until this is felt deep within, for those who are enamored of life on this planet are those that fail to learn, are those that still seek materialism, those that are still desirous of the physical experience. Until the consciousness is fed up with life on this planet, he is not accepted as student. I sense understanding dawning within each of you my students. A kinship of sorts is built by all of those consciousnesses that begin to awaken; awaken to the fact that the self cannot continue the physical existence, the pursuit of materialism any longer and it is service that becomes the central focus for each – to serve, to teach others to also turn their backs on materialism, on the pursuit of those things that can only be experienced in the physical. It is to ask other seekers – others who have awakened – did they also achieve that defining moment in their life where the soul then placed the call for the Teacher and the student was presented in the unconscious state to the Teacher who asked, “who are you to present yourself to me at this time?” At some point the student will be asked the same question in the conscious state; it is at that time that the student has typically begun to refine the response – rather than stating all of the negative, the student has begun to state the positive, “I seek to serve…I seek love…I seek to be love…I seek to offer my support to others…I seek to know and to heal myself…I deeply desire understanding.” Much work has taken place in between the first and the second asking of this question; oftentimes, many years have passed. The Teacher works diligently to aid the student who has grown tired of this existence, to determine if indeed, the student is tired of this existence or if the self had just become miserable and, as with most, misery was transient; the self has been able to improve the self’s plight and now the physical, the material existence has become more palatable once again. The Teacher recedes and returns, recedes and returns, recedes and returns as the student decides, makes the determination that the self is truly ready for the spiritual path – most are not, yet the Teacher waits for the calling and will respond whenever the student places the call. Gratitude for the Teacher is often lacking in the student, for the student rarely pauses to take note of that which has been provided that has culminated in the success of the self. One who is unable to see the support of another, to recognize that without the support the self would not have been successful, is one who is unable to teach another to be grateful in future. Karma plays a major role in the teaching style utilized with the student. The student that has been dishonest will find the Teacher providing dishonesty. The student that has misled others will find the Teacher misleading the self. The student that has been cruel to others will find the Teacher being cruel to the self. The student that fails to show gratitude will find the Teacher that demands more and more and more from the student. To understand who you are becoming one must first understand who you are in this moment as well as who you have been throughout this lifetime. It is the Teacher that draws forth recognition for the self of the self’s behavior, of the self’s desires, of the self’s pursuits, of the self’s foibles, successes and outright failures, so that the student can see the self clearly. It is unfortunate that the majority of students believe that the Teacher is attempting to shame or blame, somehow punish the student for their previous activities, their previous actions. The Teacher of course is aware of all that has transpired – it is the self that has forgotten. It is the physical teacher that seeks truth by asking questions. It is the self that responds dishonestly, for the self has changed - potentially, and has decided that the physical teacher need not be aware of all that the self has experienced. The self’s behaviors are modified, pasteurized so to say, provided in retrospect, the intensity of emotion tamped down, for it has been tamped down inside the self or spent previously with another. Recognition is no longer available to the student, unless the student turns full attention upon that which has been requested and determines to relive that which was experienced, drawing forth the emotion, making certain that the emotion is appropriate, recognizing the lesson for the self, seeking assistance from the physical teacher to determine the lesson for the other, for there is always lesson for both when pain is suffered. It is rare that the self can determine the lesson for the other. Would a student care to tell me why this would be so? Loereve: I would venture to say that, from my experience, trying to determine the lesson for another – it is most often colored by my own lessons, my own experiences, my own biases in thinking. That’s what I would respond that I’ve found. Indeed and you are correct my brother. The emotional experiences of the past, particularly those that have been shared with others multiple times – these experiences have been rewritten, either amplifying or minimizing the pain experienced by the self, either amplifying or minimizing the role of the self or the role of the other – the role that resulted in suffering. It is quite likely that the self is no longer in touch with the facts – that which truly transpired between two who failed to learn. It is to learn that is the goal of the student; it is to teach that is the goal of the Teacher. Teach/learn, learn/teach – this is the process that is followed by all consciousnesses throughout space, throughout time. To learn and then to teach, for learning fuels the desire of the self to share with another. Those who do not share have yet to learn, those who share inappropriately believe that the self has learned; yet, this is still far better than one who fails to share, for it provides opportunity to the other to question, to delve, to choose for the self. It is important for you to recognize that the ego seeks to be fed, the ego seeks to be right; affirmation need be received from the teacher to the student. Challenge is the duty of the teacher – to question the student, “Is this how you feel? Are you certain? Are you certain? Are you certain? Are you certain?” Why does the teacher ask the student so many times if they are certain? Because it is often that the student responds to the 3rd inquiry, “I am uncertain.” It is the duty of the teacher to get to the base, the root of the issue, assisting the student to see the self fully, as completely as possible in a short period of time, compared to that which would be needed if the self were performing self-observation alone. The majority of students who perform self-observation progress very, very slowly, for it is the ego that is providing the observations. It is important for you to recognize my sister, that the defensiveness that resides within, the demand for feeding that you endorse readily, is what provides you with the feelings of challenge, of unhappiness, following these teachings. 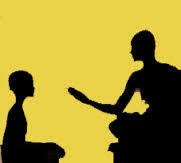 The teacher provides no negativity to the student; rather, the teacher draws forth that which resides within. The student that fails to understand this basic tenet of the student-Teacher relationship is one that begins to resent all that which the teacher brings forth for resolution. The student that claims to be desirous of knowing and understanding the self determines that the teacher is too harsh, is too combative, too aggressive; indeed, the teacher is damaging the self. Those surrounding the self – if the self is vocal, if the self has shared the self’s journey with others – are frightened for their loved one, fearful that the individual that is known and loved will disappear. All begin to draw the student towards them, away from the path, indicating that the self was far happier prior to the onset of this journey – that the self is loved, the self is accepted…why does the self seek such misery for the self? Many turn away from the path at this time, determining that the self is no longer as desirous of this pursuit as the self believed the self to be. It is important to understand that the Teacher draws forth only that which is believed to be necessary, only that which the student can bear. Recognizing the attitude that places the burden upon the teacher rather than upon the self is primary, for failure to do so results in all focus being placed upon the teacher; it is the ego that is most desirous of the focus upon the teacher. What is universal truth? To understand why the self is here embodied at this time is to understand universal truth – that which apples to all consciousnesses. That universal truth is that all have come to learn to be love. I am Osiris. I am love. It is my honor to join with you this day to remind each that to be love requires dedication, concerted effort, and a recognition of the self at all times. Failure to see the self results in future lesson. It is to be love…to be love…that is the goal set before each.